Throughout the Middle Ages, swords became increasingly popular as metal technology progressed. Advancements in quenching and tempering of steel accelerated the popularity of edged blades. Swords were wielded during battle and were seen as a prestigious accessory. Medieval swords became the subjects of legends. Historical pieces still exist and are housed in museums around the world. Medieval European Swords for sale are 40 inches in all. 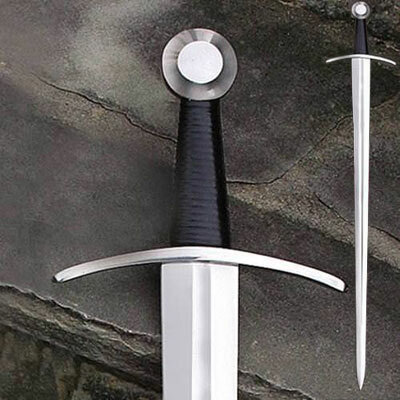 These swords are inspired by a real sword that was popular around the 15th century. This modern version has a functional 34 inch high carbon steel blade with a tough spring temper. The 2 inch wide blade tapers to a considerable point. The wheel pommel has a small radius but is solidly thick at 1 ¼ inches. These swords feature a curved cross guard for increased hand protection. The wooden grip features cord and genuine leather wrap. Each sword includes a matching black leather scabbard. They are hand crafted and weigh 2 pounds 12 ounces. Buy the Medieval European Swords for $189.99.